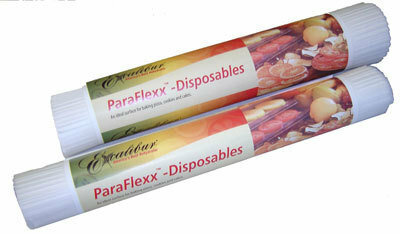 These are Excalibur's ParaFlexx Disposable Non-Stick Drying Sheets. They fit perfectly on the 12" tray; lay them down before laying out out your foods, dehydrate, and toss! Easy cleanup. Ideal for use on your 12" Excalibur dehydrator to cover your trays before laying down the placenta strips. Can also be used for home use with fruit rolls and leathers, pureed fruits, raw crackers and cookies, yogurt and sticky items. Great for easy clean up, use them to line the bottom of your dehydrator to catch any drips. They can also be used for baking liners in pans and trays. These 12 inch square sheets fit our 4 tray Excalibur Dehydrators, model 2400. Also fits model ED 700.